Life behind bars just got better for Vinny Gorgeous. 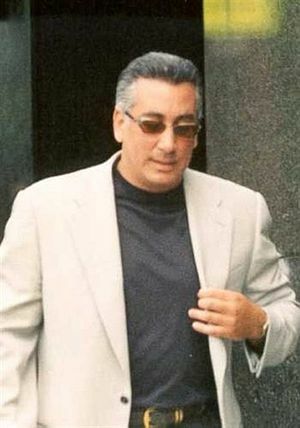 Former Bonanno crime boss Vincent Basciano is adjusting well at the Supermax prison in Colorado, where he’s serving two life terms, the Daily News has learned. Basciano, 51, is no longer confined under extremely strict conditions authorized by the U.S. attorney general, and he has graduated from his solitary hellhole in notorious Cell Block H to general-population status, sources said. “Vinny is a very strong individual and if anyone could become acclimated to that situation, it would be him,” said a source close to the flamboyant gangster. Basciano was dispatched to the nation’s toughest prison last summer after a federal jury in Brooklyn spared him the death penalty for ordering the murder of mob associate Randolph Pizzolo. He had already been convicted and sentenced to life for the murder of Frank Santoro. But general population’s Cell Block D is no walk in the park at Supermax. He’s still confined to his cell for most of the day, but Basciano now gets to participate in recreation a few more hours weekly alongside other caged evildoers, sources said. “Even general population is a higher-level security than at other federal prisons,” the source noted. Inmates graduate to less secure conditions by “demonstrating positive institutional adjustment,” according to the Bureau of Prisons manual. Basciano was lumped with terrorists after officials in New York City found a “hit list” he wrote containing the names of a federal judge, prosecutor and cooperating witnesses. Basciano has long maintained that they were targeted for Santeria spells, not death. He’s communicating with family members, lawyers and his mistress Debra Kalb, mother of his love child, sources said. A TV in his cell is the only luxury. The once-dapper gangster is assigned three khaki shirts and trousers and one pair of Velcro shoes. It’s doubtful he wears the regulation knit cap, which might muss his still neatly coiffed hair. Basciano seems to have spent most of the last six months drafting a motion to vacate his previous convictions — a 99-page, handwritten screed filed last week in Brooklyn Federal Court. “The government went to great lengths to paint Basciano with the gruesome blood of Pizzolo with one brush stroke after another,” is one of his more readable sentences. Basciano surely would want to be in Brooklyn today for the sentencing of ex-capo Dominick Cicale, who testified against his former mentor in multiple trials. Defense lawyer Barry Levin predicted that Federal Judge Nicholas Garaufis will give Cicale, who pleaded guilty to two murders, with “time served” as a reward for his cooperation.